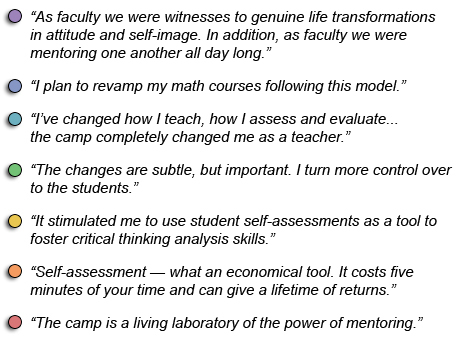 The Learning to Learn Camp provides a collegial environment where faculty, staff, and administrators come together with the common goal of producing a quality learning environment. The camp staff have a unique opportunity to improve their skills in mentoring—guiding someone who desires to improve in areas of mentoring, assessment, facilitation, communication, and peer coaching. Camp participation encourages faculty to experiment with new teaching methods, further refine their affect management skills, and develop their desire to be risk-takers and to become self-growers. After the camp, as a result of their newfound capabilities and connectivity to the greater school community, staff often become role models in their own institutions. The two most common discoveries for staff during the week of the camp are the destructive role that enabling has on student growth and how much more students can accomplish than is often expected of them.